Through the third quarter of the 18th century, writers and publishers attempted to attain respectability for a new genre of writings – novels. Beginning in the 1780s, however, bookseller James Harrison serialized selected English and continental novels, and found a newfound popularity in this new less expensive (and therefore more accessible) format. 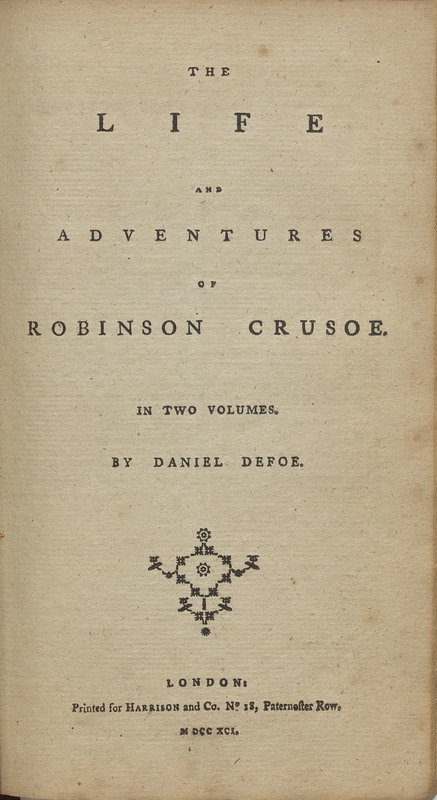 Among the titles reproduced in the serial The Novelist’s Magazine were Don Quixote, Tom Jones, and the present Robinson Crusoe, in two volumes. All titles featured engravings; shown is Robinson Crusoe escaping the wreck of his ship with a dog and a cat. The Novelist's Magazine. Containing Gil Blas and Robinson Crusoe. Vol. IV. London: Harrison and Co., no. 18, Paternoster Row, 1791. A version of this text has been digitized and is available through Google Books.